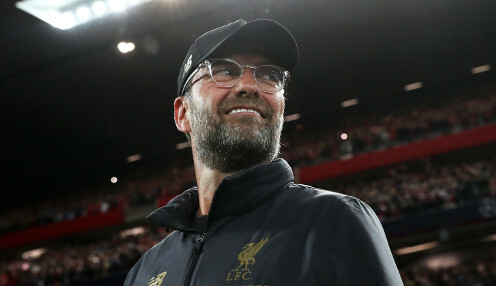 Liverpool head coach Jurgen Klopp says his side have no option other than to keep on winning if they are to edge out Manchester City in the race for the Premier League title. The Reds moved two points clear at the top of the table with a hard-fought 2-1 at Fulham on Sunday, with James Milner converting a late penalty to secure a crucial three-point return. City don't look as if they drop a lot of points, so we have to win, to win and to win. Afterwards, Klopp admitted that his team had not been at their fluent best, but he was keen to stress the importance of continuing to put wins on the board - with the Merseysiders having claimed three victories in the last week in all competitions. The German told reporters: "I think we fully deserved to win the game. It was an average game, massive result. We want to stay in the title race and that's what we did. "First is the best position you can be in. City don't look as if they drop a lot of points, so we have to win, to win and to win. "I am not in any doubt about my players' nerves. It is about intensity. We go for perfection, but it is rare that you get it. "People will say we need to be more convincing, but we are at the start of a development, not the end." Next up for Liverpool is another tough fixture, with Tottenham Hotspur the visitors to Anfield on the final day of March. The Reds are 4/7 to win that game, with the draw priced at 7/2, while Klopp's men are 11/8 to be crowned Premier League champions this season.